A couple of hours ago Phanteks send out word they offer free Socket AM4 upgrade kits and now we receive a similar announcement from CRYORIG. Owners of the CRYORIG R1 Universal/Ultimate, C1, H5 Universal/Ultimate, H7, H7 Quad Lumi, M9a, C7, A40, A40 Ultimate and A80 coolers can get a free Socket AM4 upgrade kit by mailing the company's support address. As usual, the company requires a proof of purchase of both the cooler and a Ryzen CPU or AM4 motherboard. In response to AMD’s soon to be released Ryzen CPU and AM4 platform, PC thermal solution brand CRYORIG will be providing free AM4 upgrade kits soon after the official release of the AMD Ryzen CPU release. All users of existing AMD supported products will be able to apply for the free upgrade kits. 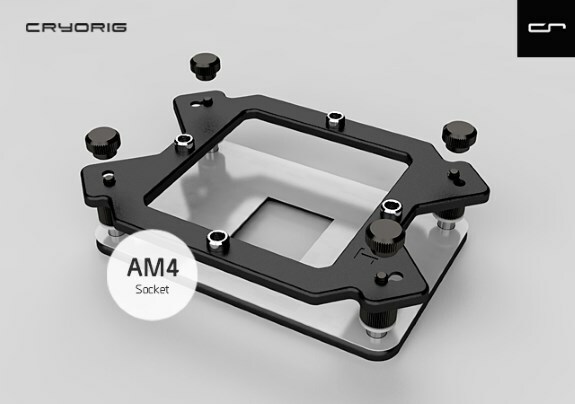 Native AM4 mounting kits will also start to hit the markets after the official release of the CPU. CRYORIG will provide all existing users and new owners of AMD supported products the new AM4 kit totally free of charge. Existing eligible products include: R1 Universal/Ultimate, C1, H5 Universal/Ultimate, H7, H7 Quad Lumi, M9a, C7, A40, A40 Ultimate and A80. and a proof of purchase of an AMD Ryzen or AM4 CPU or Motherboard. The necessary info just needs to be sent to CRYORIG support email-box “support@cryorig.com” and the kit will be sent directly to the provided address. Local distributors and select channels will also have these kits available. If I recall correctly, years ago Noctua was the first company that started offering free upgrade kits for coolers. It's nice to see more and more companies are following their lead!